Let the Jar be Broken! Go Forth Mighty Warrior!!! Oh how I love God’s timing and His desire to encourage our hearts. He is the One who created spurring one and another on toward love and good deeds . . . why does it is surprise me so that He practices it so well? And His answer to me was immediate . . .Gideon. The runt of the litter in the smallest tribe. Called to stand with only a few in the Name of the Lord to defeat the enemy. The weapons God placed in their hands? The Trumpet . . .The message of God and the announcement of the good news. Let those God has placed in our sphere of influences KNOW that God is in the house! Let us announce that He lives within us by word and by deed all for His glory. The Jar . . . Lord, break this jar of clay—bust away our insecurities, take the idols we’ve surrounded ourselves with, strip us of our penchants to be self-absorbed and remove any ounce of pride that may rear its ugly head – smash our broken pots to reveal the treasure that we hold on the inside of us . 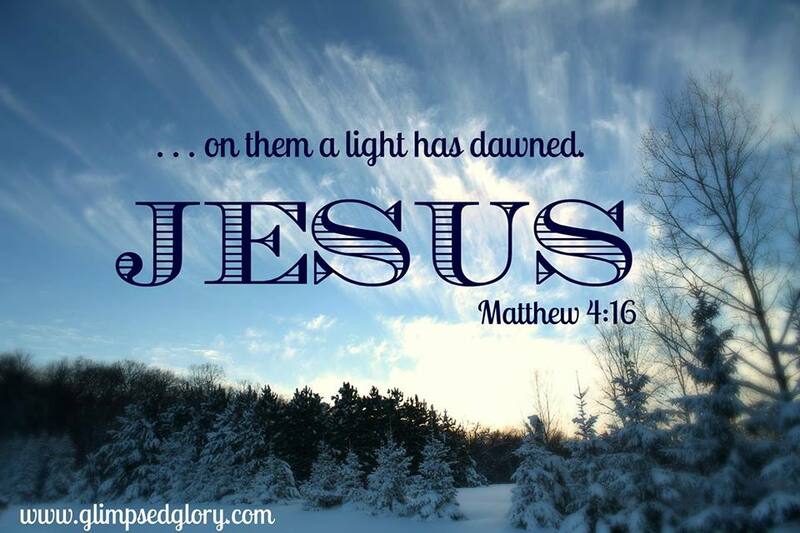 The Light . . .Shine Jesus Shine! Let Your Light shine through us and radiate Love to everyone we come in contact with! Lord, You cannot be contained and the darkness flees in Your Presence. The Light has dawned, defeated death and lives inside of every believer! The trumpet, the jar and the torch are all we need to stand firm and He will scatter the enemy . . .
How beautiful is He Sister? How can our hearts be anymore encouraged than to have the whole thing be shown to us in vivid color through Gideon and then walk into the New Testament to see it in our applied to own lives? Therefore, since through God’s mercy we have this ministry, we do not lose heart. 2 Rather, we have renounced secret and shameful ways; we do not use deception, nor do we distort the word of God. On the contrary, by setting forth the truth plainly we commend ourselves to everyone’s conscience in the sight of God. 3 And even if our gospel is veiled, it is veiled to those who are perishing. 4 The god of this age has blinded the minds of unbelievers, so that they cannot see the light of the gospel that displays the glory of Christ, who is the image of God. 5 For what we preach is not ourselves, but Jesus Christ as Lord, and ourselves as your servants for Jesus’ sake. 6 For God, who said, “Let light shine out of darkness,”a]”>[a] made his light shine in our hearts to give us the light of the knowledge of God’s glory displayed in the face of Christ. 13 It is written: “I believed; therefore I have spoken.”b]”>[b] Since we have that same spirit ofc]”>[c] faith, we also believe and therefore speak, 14 because we know that the one who raised the Lord Jesus from the dead will also raise us with Jesus and present us with you to himself. 15 All this is for your benefit, so that the grace that is reaching more and more people may cause thanksgiving to overflow to the glory of God. He never leaves us guessing about His Presence in our lives or His Presence in our battles. And hear me when I say, He does not simply provide the victory . . . . HE IS THE VICTORY! To have the God of the Angel Armies, the Creator of the Universe, the Messiah who died and rose again, The Spirit who is the Lord – Shine forth from us. What other kind of prize could compare? What greater reward or spoils from the war would we possess? What other plunder might we desire? Girlfriend, we have it all! Do not lose heart! 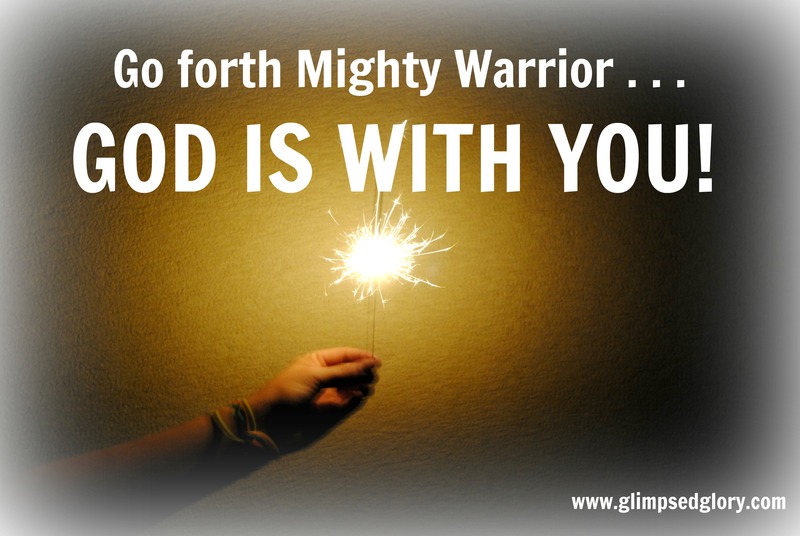 Go forth Mighty Warrior your God is with you . . . I will be praying for you Bunny. I am attending the Walworth County Day of Prayer tomorrow at Lake Lawn Lodge on Delavan Lake. About 20 churches will be represented. I am praying that the Holy Spirit will use us in spreading the Gospel of Jesus Christ. Thank you Larry! Isn’t God sweet to give me this Truth on this day? He truly is our delight! Blessings to you. Excellent post Marilyn! even though this morning may have had a few extra challenges you did not let the enemy dissuade you from proclaiming His Glory!